Manyeleti Game Reserve borders the Kruger National Park to the eastern side within the Limpopo province of South Africa. What makes Manyeleti Game Reserve unique, however, is the exceptionally low human:land density ratios. With only two different commercially operated accommodations, a maximum of 8 safari vehicles traverse the reserve. Each vehicle therefore has the equivalent of 2937 hectares to itself. It can therefore be said that this is one of the lowest vehicle density private reserves in the greater Kruger Park region. The Kruger National Park is one of the most diverse national parks in the world. It houses a vast array of flora and fauna. There are no fences between the reserves, which means that animals are free to roam unhindered. 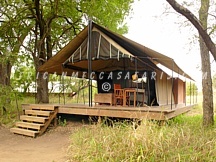 Below is a listing of Manyeleti Kruger accommodations in South Africa. To view complete details on the accommodation, click on "Read More+" under each camp or lodge photo. Honeyguide Khoka Moya Camp is situated on both sides of a riverbed, and offers an authentic African experience without sacrificing luxury, safety or comfort. Simply designed and built of corrugated iron, the large colourful lounge and dining areas of the camp overlook green lawns leading to the swimming pool. 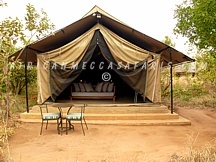 The camp comprises 12 large tents furnished in a contemporary yet comfortable style. The camp welcomes children of all ages. Tintswalo Lodge is an exclusive safari lodge under traditional grassing. 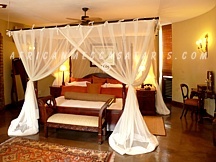 The suites are authentically decorated to recall the pioneering times of the nineteenth century African explorers. The air-conditioned suites are situated along the banks of the seasonal Nwaswitsontso River. Providing supreme comfort, privacy and effortless birding, as well as the opportunity to view a large variety of big game from the privacy of your suite.